Disclosure: This is a sponsored post, in conjunction with Quaker. I received compensation for participating in this promotion. School mornings are always stressful, between rousing the kids, getting them dressed, packing their bags and locating that one lost shoe… Breakfast can sometimes fall by the wayside. This month, I am partnering with Quaker and their Creative Oatmeal Officer, Sam Stephens from the New York restaurant, Oatmeals to bring you some fantastic kid friendly (and quick to prepare) breakfast ideas this month. Last week I shared a recipe for a Fun and Fruity Breakfast Parfait (hyperlink to last week’s post) and the week before, the recipe was for an Oatmeal “Bowl of Love” (hyperlink to first week’s post). For this week’s recipe I decided to explore the magical world of monsters! For exclusive pictures and step-by-step directions for this recipe and past Quaker oatmeal recipes visit Sam’s blog: www.oatmealchefsam.tumblr.com. Monster themed stuff is so much fun for kids. From movies, to books, to food you just can’t go wrong. 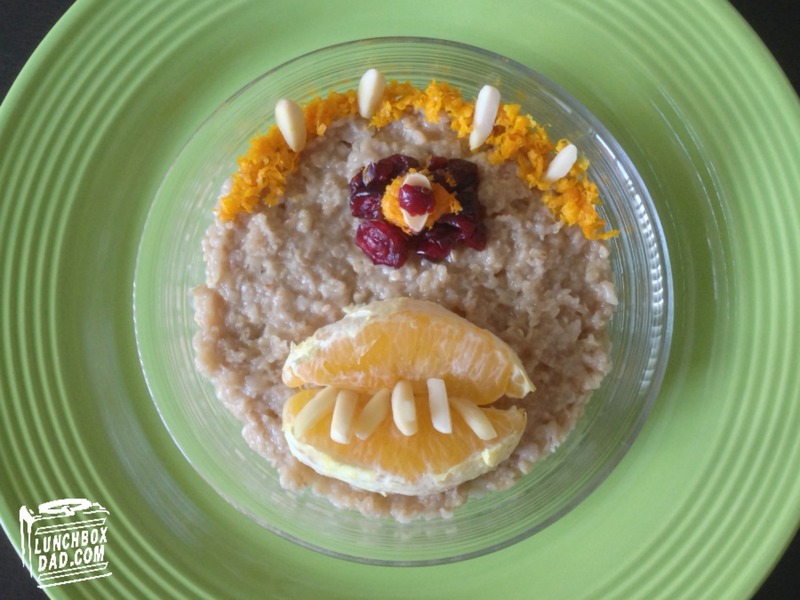 This week I turned breakfast into a “monsterously” good time with my Monsterous Oatmeal Bowl. This is perfect for back-to-school, Halloween, or really anytime! You will not want to miss checking out all the great recipes and tips Sam has on her blog, there are so many great ideas for how to start the morning right!